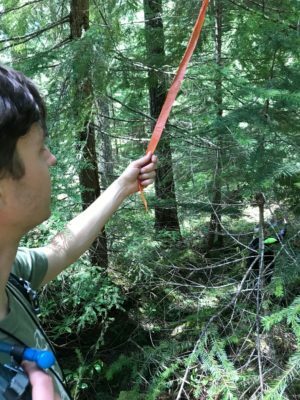 On May, 12th, I helped Cascadia Wildlands lead a field checking expedition into the Detroit Ranger District of the Willamette National Forest, in a large timber sale surrounding the Breitenbush hot springs. 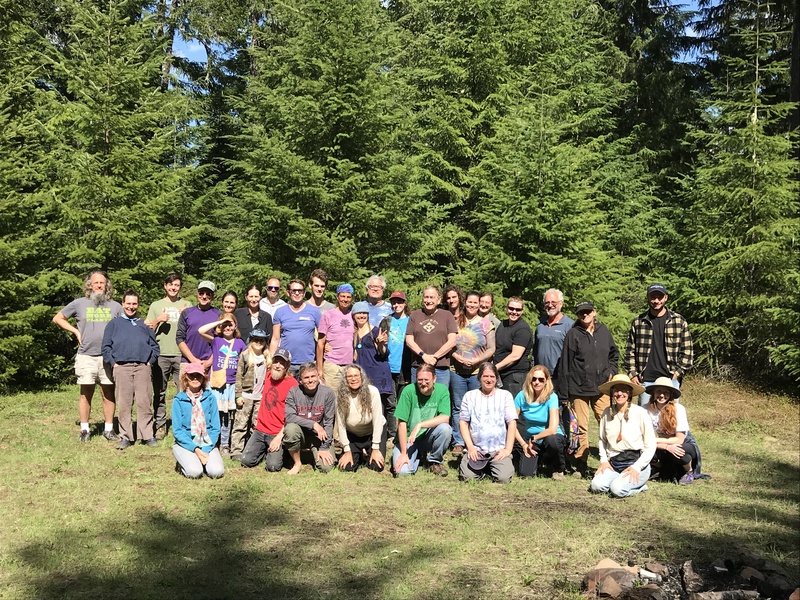 This timber sale is called the Highway 46 project, and our goal for this trip was to find evidence that we can use to litigate against it, and hopefully prevent the worst of it from happening. My friend Madeline picked me up from the Portland airport the night before, and after a dark and dreamless sleep in a friend’s front yard, we packed up the car and headed for the Santiam pass, one of the most beautiful stretches of forest in Oregon. As we drove up the old highway to meet with the rest of the WildCATs (our very own unit of on-the-ground volunteers), we found ourselves in the midst of a caravan of other field checkers, all being led by a white Mini Cooper. As we pulled up to the designated meeting place, I was astonished to see a group of at least 30 people already there waiting for the field checking to start. After a quick tutorial in plant I.D. and map reading, and of course some delicious potlucking, we split into five groups and went to explore the different treatment units of the proposed sale. In our field work, we were looking to find inconsistencies in the sale proposal, which contains many units proposed for ‘thinning’ and some areas that would essentially be clearcut. The Forest Service’s justification for the sale is to improve stand health, prevent future high-severity burns, and to create more early seral habitat (forests under 20 years old). Sounds great in theory, but the reality on-the-ground revealed that these justifications were misguided at best, and intentionally misleading at worst. Before going into our field work, we knew that several fires had burned through the project area just last summer, so investigating the true impact of these fires was one of our first priorities. If the fires did their job, they should have burned through hazardous fuels, thinned out the forest and, if the fire was hot enough, naturally created the early seral habitat that the Forest Service argues is so needed. Sure enough, upon our exploration of unit 83 in the sale, we came across some of the most extensively burned areas from last summer’s Scorpion fire. 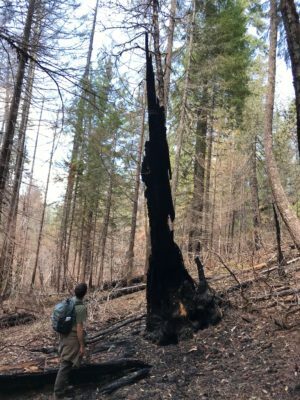 Huge trees ranging from 100-300 years in age were burnt to their crowns, allowing for plenty of light to penetrate the canopy and naturally creating the early seral habitat that the forest service claims to so desperately want. It was beautiful, and it was just what a healthy post-fire forest should look like. Aside from finding existing early seral habitat resulting from the Scorpian fire, there were also a number of other significant features that we noticed while out in the field. One of these was an unlisted waterway and riparian area flowing through one of the units. This finding was important because riparian areas are required to be protected with buffers rather than simply logged over, meaning that simply in finding this feature, we may be able to protect additional forest. The forest within the Highway 46 timber sale is inarguably one of the most beautiful I’ve ever seen, with massive douglas firs towering over a lush understory of service berry, vine maple, and yew. We even found a meadow filled with Calypso Orchids — an increasingly rare, and incredibly beautiful wildflower endemic to our region. When all of the groups got back together to debrief our findings, it became apparent that this sale not only didn’t make sense in terms of creating the already naturally existing early seral habitat, but that it would imperil a number of rare, ecologically important specimens. This is not to mention the unmarked waterway that we found, and the general integrity and health of the forest as it is now. Essentially, the field checking mission was a success, providing Cascadia Wildlands’ lawyers with evidence that this sale is not only irresponsible, but potentially stoppable through litigation. The cherry on top of this successful outing was that after all was said and done, we got to blow off steam at Breitenbush hot springs with the 15 free entrance passes that they so generously offered to us for our work protecting the forests that they love. Upon reflecting, I can’t think of any way I’d rather spend a spring day than doing plant I.D. in the woods and then spending the evening soaking in natural hot springs with a group of lovely, passionate environmentalists. These field checking expeditions not only provide ammunition for litigation, but also help to cultivate a sense of place and responsibility within the participants. It is easy to feel apathetic and hopeless when looking at a map of proposed timber sales, or a swath of clearcuts on the horizon, but it is much harder to feel that apathy after you’ve spent the day trekking through those very woods. 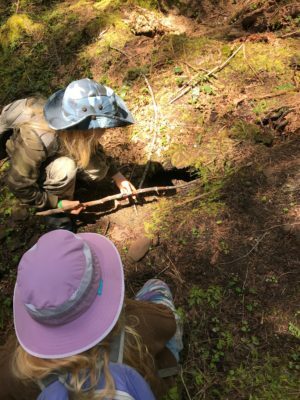 Cascadia Wildlands is currently ramping up our efforts to get groups of our volunteers field checking. If you’re interested in joining us, check out our WildCAT team here and get connected!